First time visiting Isla Mujeres? Discover Isla Mujeres... a paradise many tourists visit on a day trip, become captivated, and return to time and time again. Isla Mujeres has accommodations to meet every need and every budget. Something for everyone! Take a Day Trip and explore! Set aside one day of your vacation and take advantage of Isla’s proximity to the Maya ruins of Tulum and Coba, the eco-touristic parks Xcaret, Xel Ha and Xplore. The amazing Kukulcan Pyramid at Chichén Itzá, voted one of the New Seven Wonders of the World and of course a trip across the water to the National Park of Isla Contoy. Isla Contoy is a small island located about 30 km north of Isla Mujeres where the Caribbean meets the Gulf of Mexico. The island, only 8.75 km long and 200-500 meters wide. 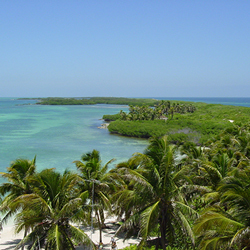 Isla Contoy is internationally recognized for its flora and fauna, especially the birds, of which more than 150 species are considered either resident or migratory. The most numerous and easy to observe are the frigate, the brown pelican and the double-crested cormorant. Isla Contoy is also an important nesting place for Sea Turtles. Isla Contoy has been protected by the Mexican government since 1961 and was declared a national park in 1998, there is a small museum and a lookout tower for a spectacular panoramic view. Most trips to Contoy include a stop to snorkel on the nearby reef, a tour of the island and the museum, lunch on the beach - usually freshly caught grilled fish with all the trimmings and time enough to explore the winding paths, relax on the beach and make friends with the manta rays that will literally bump into your legs and demand to be petted. Most people don't think of the Mayan ruins El Meco as being part of Isla Mujeres but they are. The Municipal of Isla Mujeres not only includes the island but a large part of the northern peninsula as well. The ruins are located between Puerto Juárez (the people ferry) and Punta Sam (the car ferry). The site is small, only 650 by 200 meters, and has 14 structures set in a landscape full of trees. It takes about an hour to visit the site and makes a terrific start to your Isla day trip. Plus if are not planning to visit any of the major Mayan sites during your trip (Chichen Itza, Tulum, Coba & Ek Balam) you really can’t go home without seeing Mayan ruins! Be sure to read all the plaques that are placed throughout the site. They explain what each building was used for and some have drawings of what archaeologists believe the buildings once looked like. Currently there are no organized tours to El Meco. All you need to do is take the ferry to Puerto Juarez and hire a taxi, El Meco is just a few kilometers down the road. You can ask the taxi to return for you in an hour or flag one down on the street. Remember to bring bottled water. This ancient mayan city was built in the middle of the classic period. It's name has many meanings some of which are the following: water humidity, moss water, turbid water or plenty of water. 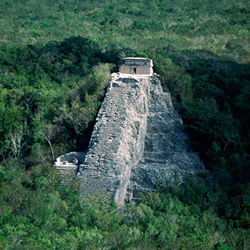 Coba is located in the middle of the jungle. Visit the archaeological site of Coba, and discover the amazing Nohoch Muul pyramid, the tallest in the Yucatan Peninsula from where you will have stunning views of the jungle. Visit a secluded Maya family set in Laguna Chabela, they will share with you ancient Maya manners. Then visit Tres Reyes an authentic Maya village where you can learn in their natural reserve that protects the flora and faunae of the area. Then enjoy a lush meal of typical food, soft drinks and hand-made tortillas. Chichén Itzá is the capital of the ancient Maya empire, its majestic buildings date back to 435 and 455 BC, and has been designated one of the modern wonders of the world. 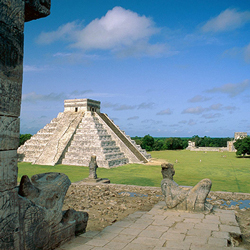 Explore the most important archaeological zone of the Yucatan; the magnificent Kukulcan Pyramid, the Temple of a Thousand Columns, the majestic observatory, the sacred cenote, and the ball court. The certified guide who will introduce you to the secrets of the Mayas, take you through the most important buildings and explain the historical significance. After exploring Chichén Itzá, you'll head to the local restaurant and enjoy a buffet of fresh salads, soups, rice, meat, chicken, fish, vegetables and other regional dishes. While eating, you'll enjoy a festive show in which the locals perform traditional dances to folklore music. 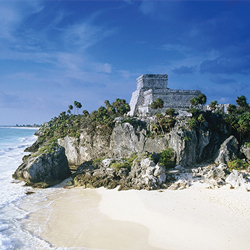 Located 130 km south of Cancun, Tulum is the only walled city of the Maya. Structures include the Temple of the Frescoes which has spectacular figurines of the "diving god".The site may formerly have been known by the name Zama, meaning City of Dawn, because it faces the sunrise. The word Tulum in Maya means wall or fence. The ruins are beautifully set against a backdrop of the turquoise Caribbean and one of Mexico's best beaches so be sure to bring your swim suit and towel. 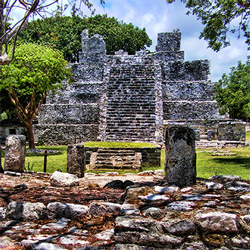 Tours to Tulum are often combined with visits to Xel-Ha or Xcaret. Tulum is a very popular tourist stop and can get crowded so if you can, go first thing in the morning or late afternoon. 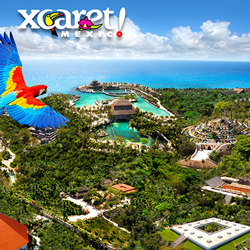 Xcaret, which in Maya means "small inlet", was originally called Ppolé Now an eco-archaeological park which offers visitors over 40 attractions, activities and restaurants. Enjoy a snorkel tour and swim in the crystal clear waters of the underground river, have fun with the Dolphin swim and visit the wonderful natural aquarium with its coral gardens. Walk and admire the botanical garden, the aviary and the butterfly nursery. Explore the Hacienda, the Mexican Folk Art Museum and the Mayan Village. 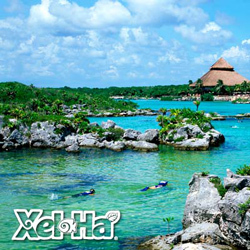 Xel Ha is an eco-touristic park very close to Tulum. It has a natural creek and lagoon which is the main attractive of the site. The sea enters this wonderful place forming a river that provides a spectacular route which mixes the salty and fresh water of the many underground rivers that run through the area. In the lagoon, a natural aquarium is formed. You can swim and snorkel among hundreds of multicolored fish. Discover this beautiful paradise walking, by bicycle or on the mini train, admiring different species of flora and fauna in their natural habitat. Immerse yourself in one of the cenotes or lagoon and enjoy the aquatic zip-lines. Indulge your taste with typical Mexican dishes in any of the four restaurants. An unforgettable experience at this All Inclusive park. 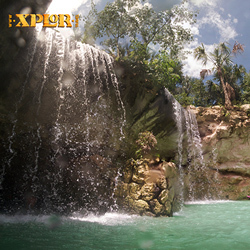 Xplor Park is a unique underground world, where you will enjoy an unparalleled adventure. During the day fly between trees and bridges, discover amazing caves and extraordinary rock formations. And at night, the Moon and stars will guide your way, marvel at the mysteries that Xplor Fuego has for you. All explorers can enjoy four incredible activities: zip-lines, amphibious vehicles, rafts and swimming in the underground river. All related to adventure and nature; these activities take place in a natural setting and outdoors. In addition, to the delight of the adventurers, they can find unlimited smoothies and juices in different parts of the Park and enjoy a delicious and healthy buffet at the "El Troglodita" restaurant.